An article published in the journal “Science” reports the discovery of a fossil deposit dating back to about 518 million years ago in the southern China’s Hubei province. A team of researchers already led the excavation of 4,351 separate fossils representing 101 species of which 53 are new. The characteristics of the deposit are similar to those of the famous Burgess Shale in Canada and the Chengjiang deposit in China, where fossil conservation is of high quality. These organisms of what has been called Qingjiang biota date back to the period known as the Cambrian explosion and will help to better understand that diversification. Allison Daley of the University of Lausanne published in “Science” a second article concerning the work of the researchers in China. The Cambrian explosion is considered the period of highest diversification of living species in the history of life on Earth. At the time all the primordial animals lived in the seas and in certain areas there were conditions that favored the conservation of organisms after their death. In particular, Qingjiang organisms could get enveloped by mud flows that caused them to sink into colder waters, where the normal decomposition of their bodies was stopped. The result was similar to mummification but on the seabed and the consequence was that even soft tissue could fossilize. Historically the Burgess Shale represents a point of reference for the palentologists interested in Cambrian organisms exactly because of the fossils’ state of conservation, however the formation of the Rocky Mountains compressed them and heated them, altering their shapes. Chengjiang organisms, on the other hand, suffered some erosion from the groundwater that flowed over the fossils over millions of years. The researchers who studied the already excavated Qingjiang fossils report that their conservation status is pristine. This deposit which already proved to be extraordinary was discovered during the exploration of rocks dating back to the early Cambrian period in that area. The discovery of traces of ancient sediments indicated that at that time there were mud flows that could have buried and preserved organisms that lived in that sea. Soon the excavations revealed the presence of fossils, which were called Qingjiang biota. The image (Courtesy Dongjing Fu et al., Science. All Rights Reserved), shows some fossils of the Qingjiang biota: (A) Leanchoilia sp. with fine anatomical details including the ones of their large appendages. (B) A new megacherian arthropod of which the internal soft tissues was preserved. (C) A possible kinorhynch scalidophoran, with segmented body armored by scalids. (D) Lobopodian. (E) A worm belonging to the phylum Priapulida. 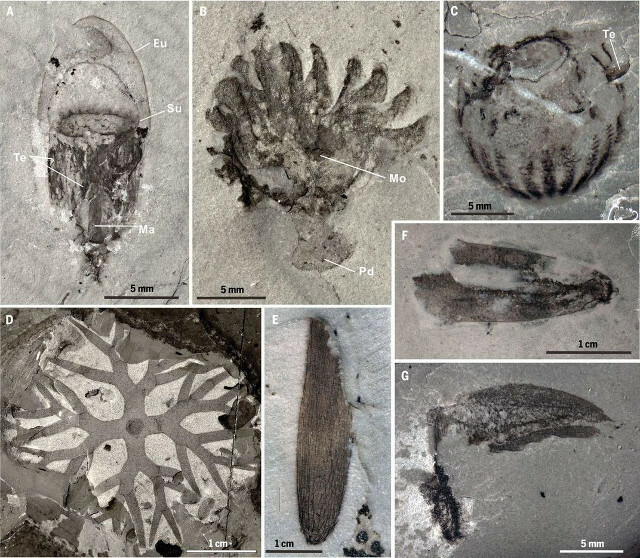 These fossils are about 10 million years older than the Burgess Shale’s and various new species belong to groups that are almost absent in that deposit and in Chengjiang biota. In fact, Qingjiang biota includes many cnidarians, the phylum that includes corals, sea anemones and jellyfish, and ctenophores. Together with sponges, they’re the first groups of multicellular organisms that emerged but many of them have bodies formed mainly of water that hardly leave fossil traces and this makes the ones in the Qingjiang biota even more precious to better understand their evolution. Paleontologist Dongjing Fu of the Northwest University in Xi’an, China, clearly stated that Qingjiang will be the next Burgess Shale. The first results confirm that even though it’s clear that this is only the beginning. The particularly stable geological conditions of the area turned it into an extraordinary treasure that offers an unseen portrait of an ecosystem that existed in one of the key periods in the history of life on Earth.